And that’s having great people, with great skills and confidences working on the front desk of those dental practices. 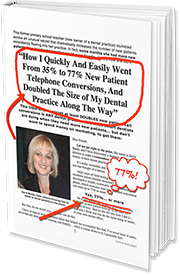 At this full day live event, Jayne will be revealing the same easy front desk strategies she used recently when coaching a small Brisbane one-dentist practice to go from $720,000 per year, to over $1,600,000 per year in her first year working them, and much, much more. Sydney: Friday 12th April 2019- Click here on this link to register. Canberra: Friday 3rd May 2019- Click here on this link to register. Brisbane: Friday 10th May 2019- Click here on this link to register. Perth: Friday 21st June 2019 – Click here on this link to register. Auckland: Saturday 29th June 2019– Click here on this link to register. Hobart: Friday 12th July 2019– Click here on this link to register. Contact Jayne to find out when the next Master Class is on near you!